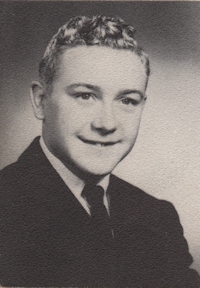 Obituary – Alexander, Alan Gary « Perry High School Alumni Association, Inc. Band 53-56, Band Student Director 55-56, Wrestling 53-56, Teen Town Mayor 55-56, Teen Town Council 54-56, Boys’ State 55, F.F.A. 53-55, F.F.A. Secretary 54-55, Boys’ Quartet 54-56, Junior Play 54-55, Home Room Vice President 53-54, All School Revue 53-56, Annual King Attendant 53-54. Former Perryan, Alan Gary Alexander, 53, Fayetteville, Ark., died at 9:05 a.m. Monday, March 23, 1992, at Fayetteville. Funeral will be at 10 a.m. Thursday in the chapel of Brown Funeral home. Burial will be at Grace Hill cemetery. Alexander was born June 5, 1938, at Lucien, the son of Ashley and Lucille Alexander. He attended schools at Pawnee and Perry and was a graduate of Perry high school. Alexander was active in band and wrestling at PHS. He attended the University of Oklahoma. A former Charles Machine Works district representative, Alexander had been involved in fire engine sales at the time of his death. He was a member of the First Baptist church. He was preceded in death by his mother and one brother, Ashley Alexander Jr. Survivors include three sons, Jim Alexander, Los Angeles, Calif., Jeff Alexander, of Guam, and Justin Alexander, Tulsa; two daughters, Alese Ashford, Dallas, Texas, and Jenny Alexander, Tulsa; his father and step-mother, Ashley and Beverly Alexander, Perry ; and two brothers, Artie Alexander, Bryan, Texas, and Richard Alexander, Perry.